We’d love your help. Let us know what’s wrong with this preview of Ancient Appetites by Oisin McGann. “An exciting new steampunk adventure” featuring living machines, murderous betrayals, and Ireland’s most ruthless family ( School Library Journal ). The slow collapse of the British Empire in the nineteenth century meant opportunity for anyone with ammunition and wit. Now the Wildensterns are by far the most powerful family—and the most ruthless. Trained from childhood in “An exciting new steampunk adventure” featuring living machines, murderous betrayals, and Ireland’s most ruthless family ( School Library Journal ). The slow collapse of the British Empire in the nineteenth century meant opportunity for anyone with ammunition and wit. Now the Wildensterns are by far the most powerful family—and the most ruthless. Trained from childhood in the arts of assassination and conspiracy and endowed with the supernatural ability to live for more than a century, the clan has grown rich, vicious, and seemingly invincible. To ask other readers questions about Ancient Appetites, please sign up. The Wildenstern family have been a dominant force in Irish finance for generations, with investments that reach out to the UK and even America. Their power is augmented by an inherited trait that offers them accelerated healing, long life, and an affinity for controlling the mysterious engimals - mechanical beasts with an unknown origin. They run their estates with a feudal attitude, with servants who are treated like slaves and tenant farmers who are basically oppressed serfs. The family is run by a Patriarch with the authority of a king, and inter-familial plots and assassinations are par for the course. But now, a strange discovery has been made. Four bodies found in a bog, that seem to have been sitting there for centuries, are discovered to be inexplicably alive. These individuals may be the ancestors of the current Wildensterns. And their medieval attitudes may be, if possible, even worse than the current state of affairs. The book has a fun, light-hearted tone, suitable for YA, with an action-oriented focus. What may disappoint some Steampunk fans is that while the genre often has a focus on tinkering, innovation and invention, all of the 'steamy' stuff here falls firmly into the trope of "Mystical Knowledge of the Ancients." Also, while the book contains the genre's seemingly-obligatory commentary on the inequities of gender, race and class, the main character is a not-very-sympathetic, self-centered upper-class brat with an unfortunate lack of awareness/compassion. The book is clearly leading him toward an 'awakening' (to happen in sequels) but although he might have a good heart, for most of the book he's pretty annoying. He's not so bad that I'm not interested in What Happens Next, however. One thing that I particularly liked about the book is that so many 'mystery' novels feature characters working on sparse clues and coming up with intuitive conclusions that, remarkably, seem to always turn out to be correct. Unlike those, this book actually has a lot of characters looking at the clues and coming to the wrong conclusion - which I found refreshing and amusing. Many thanks to Netgalley and Open Road Media for making this book available. This novel was previously published in the UK, but this is the first time it's being marketed in the US. As always, my opinions are solely my own. Number One: The Act of Aggression must be committed by the Aggressor himself and not by any agent or servant. Number Two: The Act must only be committed against a man over the age of sixteen who holds a superior rank in the family to the Aggressor. Number Three: The Act must only be committed for the purpose of advancing one's position and not out of spite, or because of insult or offence given, or to satisfy a need for revenge for an insult or injury given to a third party. Number Four: All effort Number One: The Act of Aggression must be committed by the Aggressor himself and not by any agent or servant. Number Four: All efforts should be made to avoid the deaths of servants while committing the Act. Good servants are hard to find. Number Five: The Target of the Aggression can use any and all means to defend themselves, and is under an obligation to do so for the good of the family. Number Six: Retribution against the Aggressor can only be carried out after the Act has been committed. Should the Aggressor fail in his attempt, and subsequently escape to remain at large for a full day, only the Target of the Aggression and no other person will be permitted to take Retribution. Number Seven: No Act of Aggression or Retribution must be witnessed or reported by any member of the public. All family matters must be kept confidential. Number Eight: Any bodies resulting from the Act must be given a proper burial in a cemetery, crypt, catacomb or funeral pyre approved by the family. These are The Rules of Ascension, laws that govern the bloodthirsty Wildenstern lineage whose male members can murder their way to the position of patriarch, a superior status that allows one to control the vast wealth, businesses, and assets of the family that are found throughout Ireland, England, and America. The group even possesses an accelerated healing factor (that seems to increase with the aid of gold), abnormal longevity, and a strange connection to engimals, beasts that are both animal and machine. Edgar Wildenstern, the current patriarch, has approximately four children: Marcus, Roberto, Nathaniel, and Tatiana. However, with the untimely death of Marcus, the eldest son and heir, the next in line is Roberto, the kindhearted polar opposite of Edgar. In his father's eyes, Roberto's lack of cruelty and aggression makes him weak. Thus, most of the duties and running of the family's American businesses fall upon Nathaniel's shoulders. Neither Roberto nor Nathaniel have any desire to run their horrendous family, and Nathaniel will stop at nothing to apprehend his brother's murderer. However, their are still relatives who are plotting to advance their positions, and Roberto isn't the man he appears to be. Consequently, Nathaniel may have to confront an extremely dangerous killer and four ancient ancestors who were unearthed and brought back to life. The era in which this novel takes place is absolutely fascinating. So many books that are labeled as being part of the steampunk genre take place in a Victorian era London that's been depicted far too many times. This mold is fabulously broken with McGann's Ireland-based family feud. Some readers may complain that the story doesn't contain enough features of the steampunk genre, but I'm satisfied with the engimals and the odd, "supernatural" qualities of the Wildenstern bloodline. Plus, many steampunk stories are way too complicated with their politics and technology, and I love the fact that Ancient Appetites wasn't over-complicated in these aspects. McGann did a superb job in creating an awesome, unique, and interesting family whose problems only escalate in countless fashions as the story progresses. The mystery within the novel also wan't cliche, easy to figure out, or boring in any way, shape, or form. The plot kept twisting and the characters often came to an absolutely incorrect conclusion. It was nice that the story didn't abruptly end with a simple solution and actually continued to advance. Resurrecting ancestors was also a nice touch and added a bit more danger and obstacles for the main protagonist, Nathaniel. I like the fact that Nathaniel wasn't the only main focal point of the story. There were several interesting supporting characters that added flare. Gerald, Roberto, Daisy, and Tatiana all received their fair share of character development, and they each possessed distinct personalities. When writing from multiple points of view, it isn't always easy to make each character perfectly unique, but McGann seemed to have no problems in this department! There was also a moral to the story. Nathaniel started out as a privileged teen who had absolutely everything handed to him. He even ran away to Africa in order to get away from his father's influence. However, he had to learn that you don't magically receive a position. It takes hard work, determination, and the gaining of respect in order to attain both a title and power. Plus, being cruel and heartless doesn't get you very far and pretty much destroys the lives of everyone else around you. In the end, Ancient Appetites provided a whirlwind of a ride that allows the reader to explore a family governed by cruel endeavors. The characters are surrounded by deadly plots, deceit, and recently awakened ancestors that will disrupt the entire household order. Simply put, the reader is in for one hell of a ride! My son recommended this one, and we ended up reading it together. Original enough to keep us turning the pages and competently written. Ancient Appetites is a pleasant surprise - for once, we have an engrossing YA read that isn't about a soppy romance or poorly written action sequences in an illogical and ill-drawn world. Here, the plot is complex, the characters nuanced, and at heart we have a mystery to solve. The steampunk trappings are fascinating but don't overwhelm in this odd, alternate universe Victorian Ireland. And although the first book comletes a solid arc, there is a series-long 'what is up with this world'set of mysteries that need to be answered. It makes for a satisfying read but with great potential for where McGann will go next. Story: The Wildensterns have a gift - advanced healing - that has allowed the clan to grow in power over the centuries. To prevent stagnation, murdering clan members for power plays is quite all right - as long as the rules are followed. But the warlike past that necessitated the Wildenstern ruthlessness is gone - and the latest batch of heirs aren't really interested in offing each other. Until their eldest brother/cousin is murdered. The story starts innocuously enough - young Wildenstern cousins tracking a wild 'engimal' (a machine that is an alive animal) and taming it. That should give an idea of the very imaginative world building - which will include everything from medieval, blood thirsty relatives brought back to life, to walking toasters and rebellious tenants. Although we don't really leave the Wildenstern manor for most of the book, we are given an 'upstairs/downstairs' set of POVs in the form of stableboy Francie (who is up to his neck in conspiracies and rebellions) and Nate, 18 year old son of the Wildenstern scion. A story like this works only if we have interesting characters - and in lead narrator Nate (along with cousin Gerald and stableboy Francie), we have great POVs into this very different Ireland. Add in a fun group of side characters and we have a very serious yet very quirky steampunk infused world. Admittedly, I didn't enjoy the Francie POV as much as the various Wildensterns siblings but had to laugh at the inane plots that were completely misinterpreted by the aristocrats. E.g., a simple robbery will end up being interpreted as a plot to assassinate most of the family - if only by pure chance and accident. It's all very cleverly written and defies a lot of expectations as a result. Ancient Appetites is the first book in a trilogy that’s being published for the first time in the U.S. (The full trilogy was already published in the UK several years ago.) Set in Ireland in the second half of the 19th century, Ancient Appetites is the story of a very unusual family, the Wildensterns. The British may nominally rule Ireland, but the Wildensterns have enormous power and influence. In addition to being fabulously wealthy, they have special healing powers and live abnormally long li Ancient Appetites is the first book in a trilogy that’s being published for the first time in the U.S. (The full trilogy was already published in the UK several years ago.) Set in Ireland in the second half of the 19th century, Ancient Appetites is the story of a very unusual family, the Wildensterns. The British may nominally rule Ireland, but the Wildensterns have enormous power and influence. In addition to being fabulously wealthy, they have special healing powers and live abnormally long lives. Or rather they do if no one cuts them down in their prime. For the Wildensterns are a vicious group, and family tradition allows them to murder each other to gain power, as long as certain rules are followed. Eighteen-year-old Nathaniel (Nate) Wildenstern returns home from Africa and learns that his eldest brother, the family’s heir, has died. The official cause of death is a mountain climbing accident, but given his family’s propensity toward violence, Nate is sure the death wasn’t an accident, and he and his hated sister-in-law Daisy end up working together to figure out what really happened. While Nate suspects everyone, many in the family are suspicious of him. It’s his elder brother Roberto who is now the heir, but Nate’s position in the family is now better because of the death and he’s expected to take over the family’s American interests. I really enjoyed this book. I did find the first 50 pages to be a little slow, as there’s a lot of exposition, but then the action really picked and it was very absorbing. The world that Oisin McGann has created is a vivid one. The setting is a steampunk Victorian Ireland. Mechanical animals (known as engimals) roam the world, and the Wildensterns have a vast menagerie of the beasts in a zoo. Nate’s scientifically minded cousin Gerald is trying to reconcile the existence of these beasts with Darwin’s new theories. While the Wildensterns live in opulent splendor, the rest of the country lives in dire poverty, and McGann does a good job of showing the contrast. McGann does some interesting things with the female characters. It’s a male-dominated world, and the woman of the family live very restricted lives. Nate’s sister Tatiana chafes at these restrictions, while her sister-in-law Daisy, being older, is more used to her place in the world, however frustrating it may be. Because the women seem so powerless, the men of the family consistently underestimate them, which leads to the women playing some very interesting roles in the plot. I highly recommend this book, and I’ll definitely be reading the sequels when they come out. Never in all my natural did I imagine that one day I would find myself reading an alternate fantasy historical novel set in Victorian Ireland that incorporated all the stuff of childhood classroom lessons in villainous rackrenting landlords, the Famine, evictions, fields of potatoes, wakes and Dublin slums aong with unique mad-science stuff of machine animals and landed gentry with superhuman powers. But here it is. Nate Wildenstern returns to the less than tender bosom of his family home, ruled Never in all my natural did I imagine that one day I would find myself reading an alternate fantasy historical novel set in Victorian Ireland that incorporated all the stuff of childhood classroom lessons in villainous rackrenting landlords, the Famine, evictions, fields of potatoes, wakes and Dublin slums aong with unique mad-science stuff of machine animals and landed gentry with superhuman powers. But here it is. Nate Wildenstern returns to the less than tender bosom of his family home, ruled with a detachable claw by his ruthless, heartless, formidable father. Neither he nor his older brother Roberto are made of true Wildenstern stuff, but their brother Marcus does, and it is he that is set to inherit. When Marcus dies in a climbing accident, Roberto is propelled into the unenviable position of heir, but it is Nate who is chosen to take over the task of running the family's vast business interests whether he wants to or not. Nate is determined to discover whether his brother's death was really an accident, murderous power-struggles being a family tradition, but events are complicated when a disastrous explosion unearths the preserved bodies of some distant ancestors, one of whom wears a Patriarch's ring. With the family seeing conspiracies and rebels in every corner, Nate and his sister-in-law Daisy must endeavour to keep their heads before everything goes horribly wrong. Then everything goes horribly wrong. Love a mystery-filled, action-packed family conflict where every member is fighting for power? Then read Ancient Appetites. I love a good family drama where no one can trust each other (Game of Thrones/Empire-esque) and backstabbing ensues - and this book doesn’t disappoint, with the added bonus of them having supernatural healing powers and trained in assassination. You know it’s going down with that combo. Set against a steampunk backdrop in nineteenth century Ireland, this book features fascin Love a mystery-filled, action-packed family conflict where every member is fighting for power? Then read Ancient Appetites. I love a good family drama where no one can trust each other (Game of Thrones/Empire-esque) and backstabbing ensues - and this book doesn’t disappoint, with the added bonus of them having supernatural healing powers and trained in assassination. You know it’s going down with that combo. Set against a steampunk backdrop in nineteenth century Ireland, this book features fascinatingly unique creatures called engimals, which are part machine, part animal, that will keep steampunk fans thoroughly satisfied. (They are so cool! And the main one, Flash, is kinda cute.) Side note: I looove Ireland, so hearing the Irish accent seep out of the dialogue was great. The Wildenstern family are crazy, to say the least, and their ongoing thirst for power will also keep drama lovers pleased as the relatable characters deal with events and mystery that make for an original, captivating plot. Being in 1800′s Ireland also brought up issues of gender equality, which was great to see addressed in a male dominated genre. We received this ebook as a reward for completing a survey for Owl Crate. It was an interesting story once it got off the ground. The first portion was a little slow and jumped around a lot. I wasn't sure what the focus of the story was going to be, but eventually it kind of pulls together. It starts off with discussion of engimals - living mechanical animals - then focus shifts to a death of a member of a powerful family. Events occur to uncover an ancient family secret. Treacherous behaviors su We received this ebook as a reward for completing a survey for Owl Crate. It was an interesting story once it got off the ground. The first portion was a little slow and jumped around a lot. I wasn't sure what the focus of the story was going to be, but eventually it kind of pulls together. It starts off with discussion of engimals - living mechanical animals - then focus shifts to a death of a member of a powerful family. Events occur to uncover an ancient family secret. Treacherous behaviors surround the cast of characters, none of whom are very likeable initially. The character development improves as the story develops, as does the action. This book is my first foray into steampunk novels. I actually really enjoyed it. Although the start was slow and i was thinking of switching to sometjing else ,it picked up and I could not put it down afterwards. I actually enjoyed having the unlikable characters as it gave them room for character development. Lastly the enigmals were my favourite part with the animal like qualities they possessed. Quite an interesting romp of a book! A bit unevenly paced, but full of twists I didn't see coming. Some characters/plot elements seemed stereotyped (the female side characters) or incompletely thought through (engimals), but the Victorian setting and interesting Irish details make up for that to some extent. I found this book very readable. I was not sure I would enjoy it so much since it is geared to a YA audience but it certainly did keep my interest and I read the whole book in one sitting. The story line is well developed and I especially enjoyed the engimals. Quand Nathaniel revient au manoir familial d'un long voyage aux commandes d'un mécanimal réputé insaisissable, ce n'est pas sans fierté. Malheureusement pour lui, la nouvelle du décès de son frère aîné lui fait de l'ombre. Et le pire, c'est que c'est lui que les doigts accusateurs pointent car dans la famille Wildenstern, le plus jeune peut tuer son supérieur hiérarchique afin de monter d'un échelon. Simple coïncidence ou véritable complot ? C'est que les Wildenstern sont tellement à part que mê Quand Nathaniel revient au manoir familial d'un long voyage aux commandes d'un mécanimal réputé insaisissable, ce n'est pas sans fierté. Malheureusement pour lui, la nouvelle du décès de son frère aîné lui fait de l'ombre. Et le pire, c'est que c'est lui que les doigts accusateurs pointent car dans la famille Wildenstern, le plus jeune peut tuer son supérieur hiérarchique afin de monter d'un échelon. Simple coïncidence ou véritable complot ? C'est que les Wildenstern sont tellement à part que même les concernés sont difficilement surpris par tout ce qui peut leur tomber dessus. Eh bien voilà une sympathique surprise littéraire à laquelle je ne m'attendais pas ! Reçu avec l'une des Box de Pandore , ce roman m'a apporté tout ce que j'aime lire : de l'originalité, des personnages touchants/charismatiques, du farfelu, de l'humour, une ambiance immersive. Autant être honnête, de la part d'un livre que je n'avais pas moi-même choisi, je ne m'y attendais absolument pas. On débute l'histoire en faisant connaissance avec Nathaniel et son cousin médecin Gérald mais aussi avec le premier "truc en plus" de ce roman, à savoir les mécanimaux, hybrides animaux et moteurs (aussi bien véhicules qu'animaux de compagnie), une espèce spécialement créée pour l'occasion par l'auteur. Eh bien si je vous dis que même le mécanimal principal de l'histoire, Foudre, est touchant, vous me croyez ? Alors pensez bien que c'est valable pour les personnages humains ! Quoique "humains"... z'ont bien un truc qui diffèrent des gens normaux même si ce premier tome n'en dévoile pas plus à leur sujet... Cependant, ils ne sont pas avares d'humour et encore moins d'originalité ! Que ce soit notre Nathaniel, son cousin l'homme de sciences avides d'expériences (morales ou pas), le (trop) gentil Roberto et son énigmatique femme Melancolia, Edgar l'exécrable patriarche, Tatiana la petite dernière, féministe en herbe, Francis le garçon d'écurie, Slattery l'homme de main détestable, les valets, les gardes du corps... tous sans exception apportent leur touche colorée à cette famille complètement loufoque et aux principes souvent douteux. En tout cas, les journées tout comme les nuits ne sont pas de tout repos chez eux ; si je ne dis pas de bêtises, il y a bien trois événements majeurs différents dans Voraces, donc je vous garantie qu'on ne s'ennuie pas, bien au contraire. Ça et quelques scènes cocasses avec répliques rigolotes, il ne m'en fallait pas plus pour passer d'excellents moments de lecture. Agréablement surprise aussi par le fait qu'il soit "jeunesse" ; on ne baigne pas dans le sang à tout bout de champ certes mais j'ai trouvé certaines scènes plutôt... audacieuses pour un jeune public (décapitations, empalements et même, à un moment, j'avais l'impression d'être en plein banquet de Game of Thrones ) ; je sais bien que nos successeurs sont habitués à pire maintenant mais ça me surprendra toujours un peu... Par contre, pour moi, ça a été un très bon point ! Imagine growing up in a rich, powerful family where you are trained from childhood the many ways to assassinate your quarry and how to defend yourself against an assassin. Imagine too being encouraged to develop other traits such as a love for violence and an inability for compassion. Add to that a bit of magic and wonder - why do the members of the ruling Wildenstern family live for so long, and seem so indestructible? The discovery and use of engimals (wonderful, intriguing creature/machines y Imagine growing up in a rich, powerful family where you are trained from childhood the many ways to assassinate your quarry and how to defend yourself against an assassin. Imagine too being encouraged to develop other traits such as a love for violence and an inability for compassion. Add to that a bit of magic and wonder - why do the members of the ruling Wildenstern family live for so long, and seem so indestructible? The discovery and use of engimals (wonderful, intriguing creature/machines you will enjoy learning about as you whiz through this book) and an extraordinary zoo on the family grounds with some not-so-typical animals add to the thrill and suspense of the story. When Marcus, the Heir to the ruling Patriarch dies in a mountain-climbing accident, his younger brother Nate, 18, is just returning home from a trip to Africa and an exciting engimal capture. Nate doesn't believe Marcus died in an accident, and he's determined to find out exactly what happened and who was involved. Could his brother Roberto or his wife, Daisy, been involved in some way? If so, how and why? Although Roberto is next in line as the Heir, is Nate in danger? Although Tatiana, Nate and Roberto's sister, is only14, she also has some tricks up her sleeve. But is she on the path to becoming a ruthless assassin, or a courageous crusader for truth instead of deception? As Nate investigates, readers learn more about his family (and their servants) and their dispositions and for some of them, cruel intentions toward not only the family, but the poor people who live and work on their estate. During Marcus's funeral, bog bodies are discovered, and Nate's cousin Gerald begins a series of experiments to find out the bodies' history and identities. It's a parallel universe during the Victorian Era, the time of the Industrial Revolution, with Steampunk animals that combine aspects and physical characteristics of machines. The Wildenstern family has its hand in many businesses but captures, tames, trains and harnesses the powers of these dangerous creatures. The Wildensterns have amassed one of the largest fortunes in the world. But beyond their reputation for almost limitless wealth and good fortune, the Wildensterns have a reputation for e It's a parallel universe during the Victorian Era, the time of the Industrial Revolution, with Steampunk animals that combine aspects and physical characteristics of machines. The Wildenstern family has its hand in many businesses but captures, tames, trains and harnesses the powers of these dangerous creatures. The Wildensterns have amassed one of the largest fortunes in the world. But beyond their reputation for almost limitless wealth and good fortune, the Wildensterns have a reputation for exceptional physical strength and endurance - the power to survive that which would kill ordinary men. The family is known for its ability to survive mortal attacks and dangerous situations. Like some of the other powerful and wealthy clans, they are gifted with the ability to heal faster and better by physical contact with gold. Unlike most other powerful families, the males in their line are allowed to murder or assassinate family members if it brings them closer to the line of succession. Oisin McGann has created a fascinating world with clear complex rules of behavior, hierarchy and class. There's family drama, a dashing young male lead, spirited young women eager to find their place in the world, vast wealth and power, treacherous and jealous relations - a wonderful, gripping read with much humor. I'm looking forward to the next books in the series. One of the most fascinating aspects of Oisin McGann's Ancient Appetites is the consistency with which he builds a world where one is encouraged to murder the eldest member of the family in order to become heir to the Wildenstern fortune. Much of the story follows newly returned to Ireland Nate, but it is the surrounding characters which breathe life into the book. The first three quarters feel rather like McGann is building the world and creating the scene for a final quarter that just never let One of the most fascinating aspects of Oisin McGann's Ancient Appetites is the consistency with which he builds a world where one is encouraged to murder the eldest member of the family in order to become heir to the Wildenstern fortune. Much of the story follows newly returned to Ireland Nate, but it is the surrounding characters which breathe life into the book. The first three quarters feel rather like McGann is building the world and creating the scene for a final quarter that just never lets up until the moment it has to. The writing is sure handed and interesting enough to propel one through this dangerous but fascinating environment. The extreme seems normal up to the moment when everything gets particularly crazy and then, just like Nate, we are forced to see just how wrong the Wildenstern way of life is. Ancient Appetites is truly an odd but compelling journey that's just enough alternate history to be considered steampunk, but not so much that you feel alienated by the differences in the world. It's strange and tantalizing with a few glitches here and there. Complete enough that there is closure, you'll still want to know what can possibly happen next to the Wildensterns. It's sure to be a wild ride just like this first volume. It's a good book to start off when you don't know what to read. It may look very boring in the beginning but it's just for placing reader in the young adventurer, Nathaniel Wildestern, who is trying to catch his new steampunk beast (Well, I forgot how to say the real term written in the book. So, let's just keep it like that.). The introduction really starts when Nathaniel finds out that his older brother dies in an "accident" (Now, why the "accident"? Because Nathaniel refuses to believe that h It's a good book to start off when you don't know what to read. It may look very boring in the beginning but it's just for placing reader in the young adventurer, Nathaniel Wildestern, who is trying to catch his new steampunk beast (Well, I forgot how to say the real term written in the book. So, let's just keep it like that.). The introduction really starts when Nathaniel finds out that his older brother dies in an "accident" (Now, why the "accident"? Because Nathaniel refuses to believe that happened to his brother). At that moment, many members of the Wilderstein family will accuse the main character for pushing his brother off a cliff. The young man will have try to prove his innocence. I won this book with a Goodreads giveaway. I'm not really sure how I feel about the steampunk genre and this book really didn't change it for me. It was a little slow to get going but wasn't as difficult once I got into it. In Ancient Appetites, the Wildenstern family has held power in Ireland for generations. They have a ruthless Rule of Ascension by which family members are able to kill other family members increase their status in the family without penalty. The youngest son comes home to find I won this book with a Goodreads giveaway. I'm not really sure how I feel about the steampunk genre and this book really didn't change it for me. It was a little slow to get going but wasn't as difficult once I got into it. In Ancient Appetites, the Wildenstern family has held power in Ireland for generations. They have a ruthless Rule of Ascension by which family members are able to kill other family members increase their status in the family without penalty. The youngest son comes home to find the eldest son has been killed in a way not in keeping with the Rule of Ascension and is set to investigate that death. An interesting take on the steampunk era in Ireland combined with fantasy elements, this story is an interesting read. I like the characterization though not all the characters were likable. It moved at a good pace and kept the reader's interest throughout. 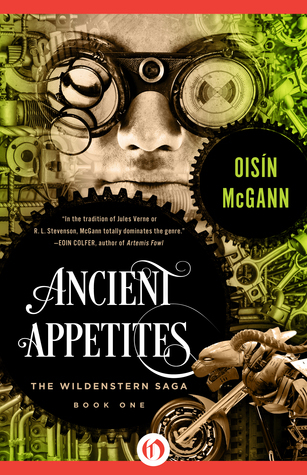 A fast-paced YA book, Ancient Appetites starts the McGann's trilogy of the fascinating Wildenstern family. Despite a slow start, the story picks up after the first 40 pages or so, delivering a compelling plot and well-developed characters, blended with enough fantasy and fact to hold your interest. I enjoyed this book, but needed to read about fifty pages until I started to. Slow beginning. I had read the second book in this series and liked that more. This book I could not score as highly, so either it isn't as good, or my tastes have changed. Still, an enjoyable read. Slow start but once the story got going, I was hooked. I read it to get the feel for the time period, but ended up engrossed in the story and wanting to read the next book as well. The idea of engimals is simply brilliant. Ancient Appetites is unlike anything I've read before. The engimals are an interesting element, but I didn't feel like I fully understood or took to them. However, the dead peat bog people were fascinating. I would've liked that storyline to have developed more. Absolutely loved this book. Fun, witty, bloodthirsty. Just wonderful steampunk. Despite his writing habit, he spent most of school convinced he was going to become a zoologist, an aspiration he lost after taking Born in Dublin in 1973, Oisín spent his childhood there and in Drogheda, County Louth. He started writing and illustrating stories in copybooks when he was about six or seven, setting himself on a path that would steer him well clear of ever obtaining of a proper job. Despite his writing habit, he spent most of school convinced he was going to become a zoologist, an aspiration he lost after taking his first art exam in third year at St. Olivers Community College. Unable to conceive of a way to make a living from writing fiction after his Leaving Cert., he decided to fund his dreams of being an author by working as an illustrator. He signed up for a design and print foundation course in Ballyfermot Senior College, Dublin, in 1990 and then studied animation at Dun Laoghaire School of Art and Design.